A great Yorkshire partnership was the theme for the launch of Yorkshire Tiger’s rebranded service from Leeds to Leeds Bradford Airport. 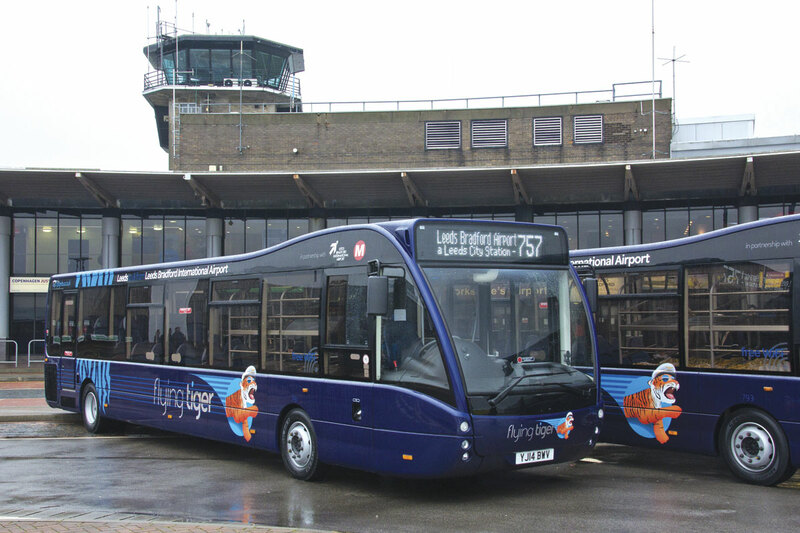 The new ‘Flying Tiger’ operation, representing an investment of over £0.75million by the operator, is a partnership between the Arriva owned operator, the Airport and Metro – the West Yorkshire ITA, using new Optare Versa vehicles built locally in Sherburn in Elmet. Following their short speeches, Martijn and Tony joined Optare’s John Horn and Philip Joyce from Metro in donning pilots caps for the photocall, adding sunglasses which were unfortunately totally inappropriate for the grey and wet forecourt of the airport. The rebranded Flying Tiger service will operate on an increased frequency offering three buses per hour between Leeds city centre, railway and bus stations to the airport. The majority of the service is operated commercially with support from Metro enabling an increased provision of early and late journeys. A half hourly frequency is provided on Sundays. 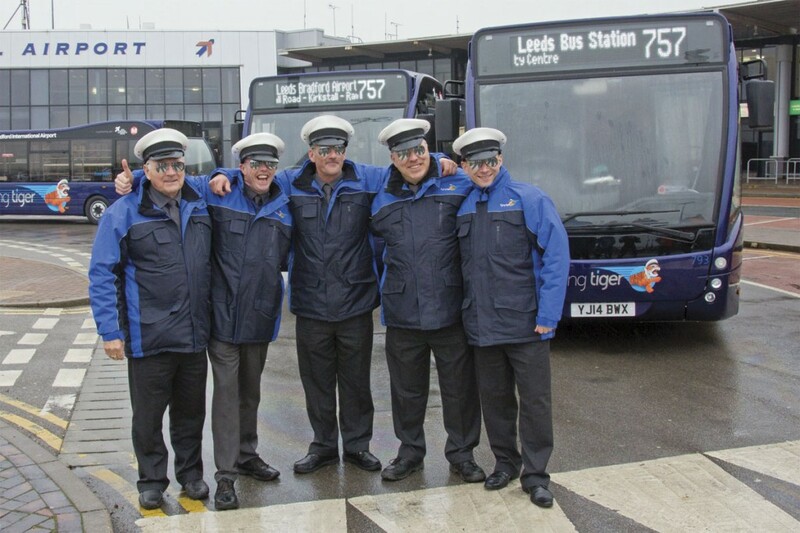 The 757 is operated from Yorkshire Tiger’s Leeds depot with a hand picked team of 14 drivers who have been issued with smart new uniform jackets matching the vehicles. The brand design has been undertaken by Best Impressions and features a new blue colour scheme with a leaping tiger wearing a pilot’s cap and sunglasses. Development work and driver training for the relaunched route has been undertaken by Transportant Solutions working with Yorkshire Tiger. Buses provide the closest drop off to the airport’s terminal buildings. This, combined with charges for private vehicles picking-up and dropping off further away, has already driven an increase of 20% in public transport usage according to Tony Hallwood. He expects the new brand to deliver further growth, not just through the increased frequency but also through providing a positive first and last impression of Yorkshire with smart, experienced and knowledgeable drivers setting a new standard. A range of flexible ticketing options is offered for Flying Tiger, starting at £3.60 for a single journey, with Euros accepted to help incoming travellers. MetroDay tickets are valid and tickets can be bought online in advance. Leaving Leeds city centre, Flying Tiger uses Metro’s A65 Bus Corridor to achieve a scheduled journey time of 37 minutes from Leeds bus station to the airport. 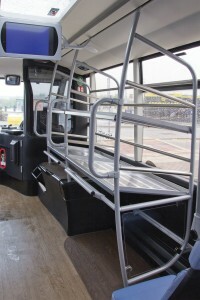 Access to the airport bus station is barrier controlled to restrict unauthorised access. Five high specification Optare Versas are being added to Yorkshire Tiger’s fleet for the enhanced operation with three completed in time for the launch event. 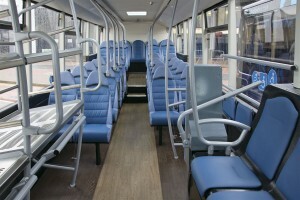 The 11.7m Cummins powered Euro5 vehicles offer 38 Esteban seats trimmed in eLeather, consisting of 14 forward facing pairs of high back seats, a row of five seats at the rear, three inward facing seats over the front nearside wheelarch and two tip-up seats in the nearside wheelchair bay. Gangway side armrests are specified for a number of seat pairs and, for the first time on an Optare product, charging points offering both 240V three pin and USB connections are installed beneath eleven seat pairs. 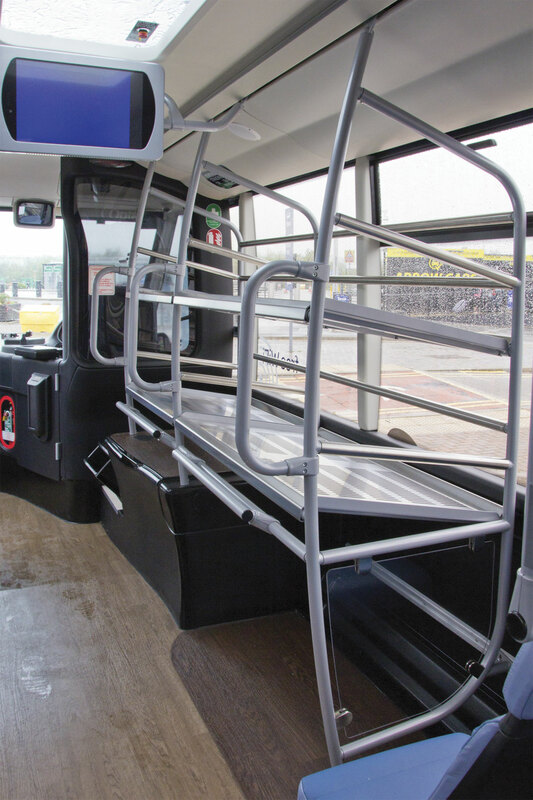 To meet the luggage requirements of the Airport service, Yorkshire Tiger have worked with Optare on the design of the new easy access rack system installed over the front offside wheelarch, which also has facilities for ski storage behind the driver’s bulkhead. The new buses feature free to customer wi-fi together with audio and visual next stop announcement facilities, making travel by bus easier for all. Optare Sales Director John Horn highlighted the importance of local customers to Optare ‘Yorkshire buses for Yorkshire people’ and the company’s ability to deliver customer specific requirements, referring particularly to the racks and power supplies. The latter have apparently already attracted interest from other Optare customers. John also emphasised the fuel efficiency of the lightweight Versa, expecting the new vehicles to deliver 12-13 mpg in service. The 757 is one of three interurban links to Leeds Bradford Airport previously branded Airport Direct. Yorkshire Tiger also operate the hourly 747 from Bradford direct and the hourly 737 from Bradford via Shipley that continues to Harrogate. Metro provide some support for both services and support is also provided by North Yorkshire County Council for the 737. 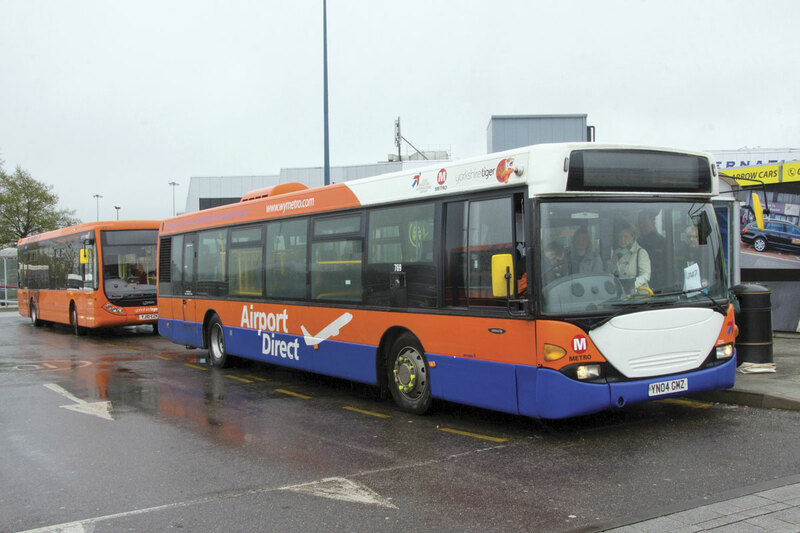 As part of the upgrade of public transport links to the airport that commences with the 757 Flying Tigers, the existing Scania single-deckers used on the 737/747 are being refurbished by Arriva for Yorkshire Tiger. To celebrate national Catch the Bus Week which commenced on 28 April, Yorkshire Tiger are offering all staff working at Leeds Bradford Airport a chance to sample their services for free on Friday 2 May, simply by showing their airport ID to the Yorkshire Tiger driver on the three services. Airport staff are also offered one third off all Flying Tiger monthly, quarterly and annual season tickets.